If you know a young girl, there is a good chance you've heard "Let it Go" about a zillion times! Disney's "Frozen" has seemed to take over the world. While it was tough, I was able to get my hands on this panel. The coordinating prints were long gone, so I improvised! While I was in NY, I purchased a couple of yards of this white fabric that was partially see thru. I added a blue solid behind it, and loved the lacy look it gave! AccuQuilt Go snowflakes, from Fairy Frost fabric. And a soft Minky back. Having never used Minky before I had to get some advise on long arming it. Wow, does it quilt up nice. I'd seen the movie long ago, and never dreamed it would take off like it did. So, don't you know, I had to have my own copy of it. It was in my stocking when I woke up Christmas morning. You know your thinking it too! Hope it was a Merry Christmas for all of you! Wishing you all, a very Merry Christmoose! Who's hanging on your tree? When a friend of mine came up with these guys, I knew I was hooked. Her inspiration came from Disney car antenna toppers. Now you have to admit, they are too fun! If you go to Pinterest and look for crochet balls, there are lots of different free patterns. The one I used is from Naztazia found HERE. You've just gotta check these out! Happy surfing! And it goes without saying... Happy Holidays! You all know that I love anything with a good sense of humor! 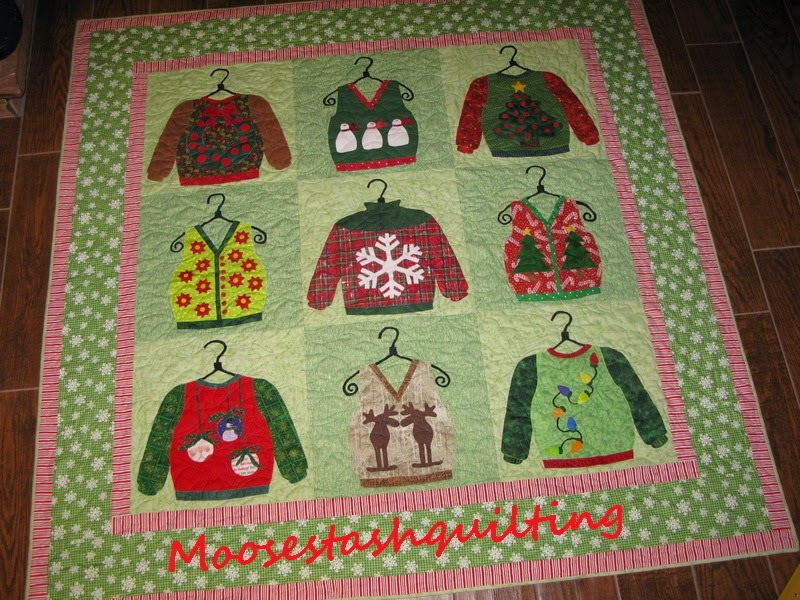 This year "seams" to be the year that crazy Christmas Quilts have caught my eye. It's hot off the "binding" press, so to say! Oh my gosh, I just can't tell you how much fun this was to make. Pull on that wreath sweater and show your Christmas Cheer. Frosty and his friends getting ready for the big day! Can you say...coo-coo for Poinsettias? Fly that little flake flag! Hang another ornie from your neck for me! and yes, you have seen it already! Last but not least! It could only get better if they actually lit up! While I was quilting this, I actually had to shut of my long arm to watch Good Morning America's Ugly Christmas Sweater challenge. It was about the funniest thing I had ever seen. Whatever your sense of humor, I do hope it includes a holiday sweater! Yes, you read that right, it is called dashing thru the sew. You know those last finishes, before we are all in full holiday swing. This is a pattern I bought in Houston this year called "Surprise". It looks like a normal little scrappy quilt, but inside is the surprise. When you fold back the flaps, just what do you see. A Strawberry Shortcake peeking back at me. Along with an array of other goodies. An eye spy sort of quilt. Are these just the cutest? What a great teaching tool. It's a great way to use those fun little novelty prints we collect. And a fun stash buster. on each block, you could attach numerous things to them. Heck, you could even add embroidered pieces in themes your child loves. Where's the moose you ask? Hope all of your are about done with your "sew"
As for me...I keep saying it is, but then, something new happens! All I know for sure, is that after the holidays are over, I am going to be making up more of the blocks with my novelites and keeping them till the need for a new quiltie arises. You know, a bit of pre-planning! With the help of Random.org, #56 Mindy was chosen. Here is what she had to say. So fun and bright! I have a budding artist in my house that would love to have this! Congrats Mindy, you and your little budding artist will be receiving this package as soon as I get your mailing info. It's all packed up with lots of goodies and ready to go! :-) I send you and email this morning! For all of us in blog land, we know we are all winners. Me because of you, who take a little bit of time out of their day to visit my blog and leave such sweet comments, and you for all the information you share with all of us every day! It's a great community that bring such joy into so many lives. Thanks to Sew Mama Sew for sponsoring this give away day, as well as my blogging buddies who participated in making this a great success! I wish each and every one of you the very best of holiday season. I've joined in on the cause...what about you? Every year breast cancer takes the lives of so many of our friends, family members and beloved bloggers. 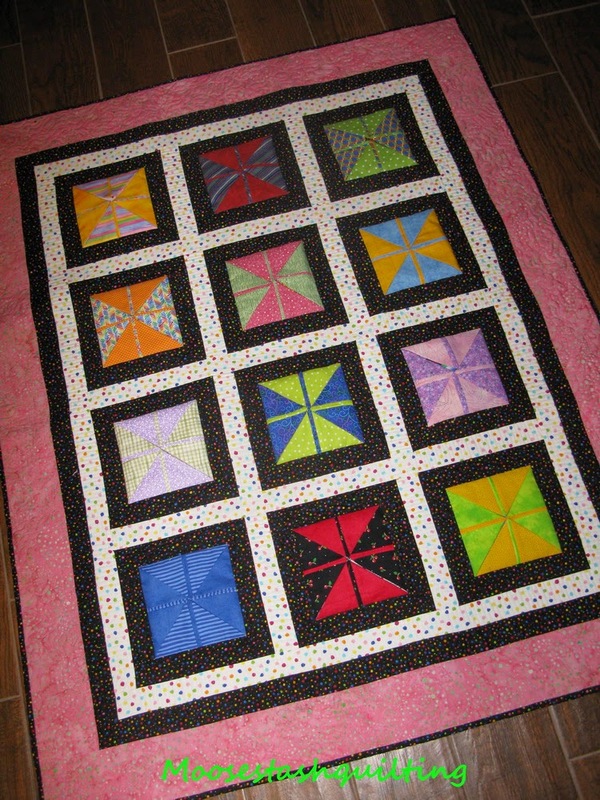 Madame Samm at "SewWeQuilt" has taken a stand to support them with this new blog hop! Right now I am counting my blessings as I do not know anyone struggling with it. So, I have adopted someone. For me, that doubles my joy!!! There are a few spots open for this hop...what are you waiting for? You can check out all the information right HERE. The lovely Pat from Scrapatchs will be doing the honor of hosting this hop. We would love for you to join us, and make someones day a little brighter! As for me...well, all I can say is, the moose are getting creative on me...they can't wait to have their day to show their support! Welcome to Sew Mama Sew Giveaway Day. I can't think of a better time of the year to celebrate all those, who make life so special for us bloggers. Thank you "sew" very much for bringing all of us together to celebrate this wonderful world of blogging. I have a little giveaway to offer up. This little journal, to keep track of all those commitments. I like to keep one with me, to jot down those random thoughts. This is a fun little Anita Goodesign in the hoop project. It can be yours, just for leaving a comment. I will be picking my winner on Friday Dec 12! I just love the element of surprise! who share a piece of themselves. Wishing you all the very best, the holiday season has to offer!